One of Proston’s most baffling mysteries was finally laid to rest on Wednesday when the remains of Charles Shepherd were reinterred at Proston Cemetery. Mr Shepherd was a reclusive grazier who died in 1935 without any heirs. But in his will, he bequeathed £10,000 pounds to the Anglican Church to build St Peter’s at Proston on condition his body be buried beneath it. Mr Shepherd was originally buried at Proston’s cemetery but when construction of the church began two years later, his body was exhumed and reinterred under the building’s foundations in accordance with his wishes. When the church opened in 1939, this fact was recorded on a plaque that was affixed to one of the pews for the next 76 years. But when the Anglican church decided to deconsecrate the building in 2015 they were unable to locate Mr Shepherd’s remains in the building’s mortuary, which was where church records indicated they should be. 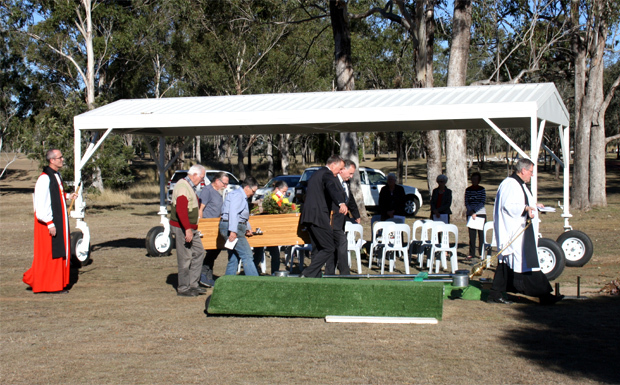 Bishop Cameron Venables – who carried out the deconsecration ceremony – put out a call for anyone who might know what had happened to Mr Shepherd’s body to come forward, and a report about the mystery in southburnett.com.au gave the story national publicity when it was picked up by the Fairfax network. 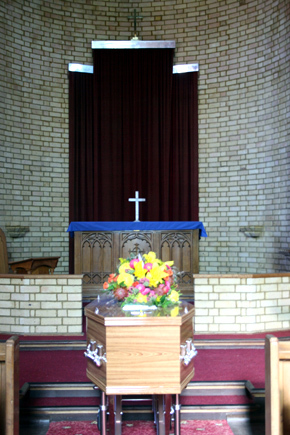 Soon afterwards, an elderly local man got in contact with the church to say he had been present at Mr Shepherd’s original re-interment service. He told church officials that while the pew plaque and records indicated Mr Shepherd’s body was in the church mortuary, the body had actually been interred in another part of the foundations. This led the church to call in experts who used ground-penetrating radar equipment to locate an underground anomaly that seemed to be consistent with a formal burial site. Subsequent excavations later located half a casket handle, a metal snuff box, and carbon material that is presumed to be all that now remains of the burial. This material was placed in a new casket which was re-buried for a third – and hopefully, final – time at Proston Cemetery on Wednesday in a ceremony presided by Bishop Cameron Venables and Archdeacon Mark Carlyon and attended by about 20 Proston locals. “We were relieved that we found some evidence of a casket and remains as it proves we were thorough in our search and correct in our quest to solve the mystery,” Bishop Venables said. “The discovery of the handle conclusively proves that it came from his casket and we are thankful the remains of Charles Shepherd have been found, as he is very dearly thought of in the Proston community and is considered by some to be the unofficial guardian of St Peter’s. 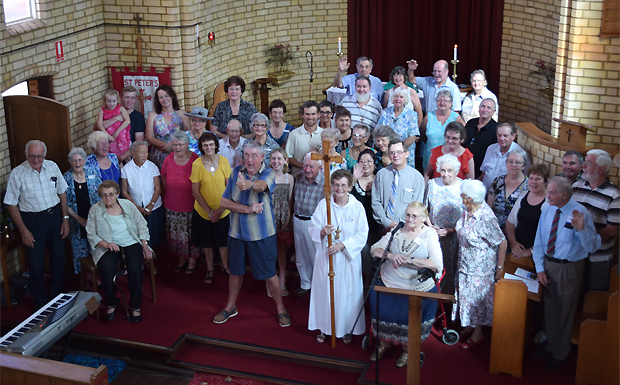 The church building, which won its designers a Royal Australian Institute of Architects Queensland Meritorious Architect Award (Country Division) in 1940 and is listed in Queensland’s Heritage Register, has now been put on the market.